Week 1. This is where it all starts. This is the first week, and we received the front section of keel. There are 7 sections which make up the complete keel. We also received the first 4 frames and the bits for two stands. The parts are all laser cut, good quality ply wood. 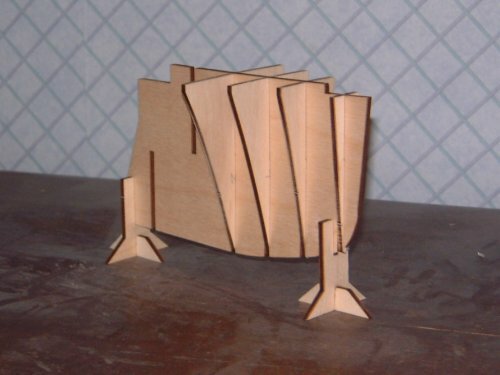 Ply wood is ideal for this section of the model as it does not warp very easily. The laser cutting is very good and the parts fit together accurately. After cutting them from the sheet, a quick rub with sand paper is all that is needed to prepare them. Then we just fit the frames into the first four slots in the keel section. We are told not to glue the parts yet, and I hope the reason is to finish the keel before adding the decks. However, if you want to see how it's progressing, hold the bits together with tape. 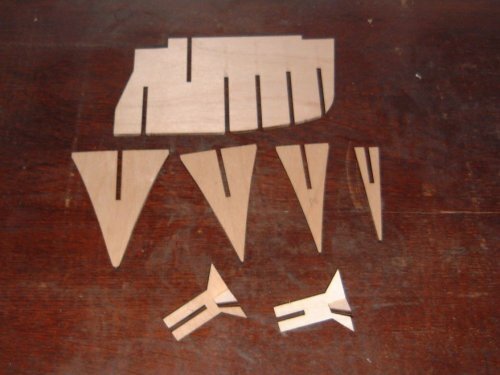 You must have a straight keel to stand any chance of building a straight model. The only way to ensure this is to complete the keel on a flat building board. Ideally you should pin down the keel while the glue is setting, but you could manage it quite satisfactorily on a flat table. It will just take a bit longer. You may also like to keep some of the off-cuts as these will be handy packing pieces. This will become clear later on - trust me !!!! Looking at Fred's site, it will take 10 issues to get a complete keel. There are two stands to make, and theses are just a couple of bits of ply to glue together. Use a good quality white PVA glue to glue the parts together. This will allow the bits to be moved a little to get the position correct, but the glue also 'grabs' quite quickly. Use masking tape rather than 'Sellotape' as the glue is designed to come off the model rather than stick permanently. We should get the next section of keel, another two frames and a couple of small ply bits next week.